I had only spent time in France once before, in the year 2009 when my husband and I joined Hindriks Tours for a custom designed bicycle tour to ride several of the popular Tour de France routes in the French Alps. Just like in those goofy romance films, I had fallen in love with that part of France during the visit: the mountain towns, the food, the farms, the people. In August, I was beyond fortunate to receive an invitation from the lovely and inspiring Linda Quirk, founder of the non-profit Runwell and ultra endurance athlete, to accompany her and Pam Rickard to help crew for them at the North Face Ultra Trail du Mont Blanc (UTMB) and Courmayeur Champex Chamonix (CCC) ultra races, respectively. I was delighted as this would be my second opportunity this year to be a crew member. 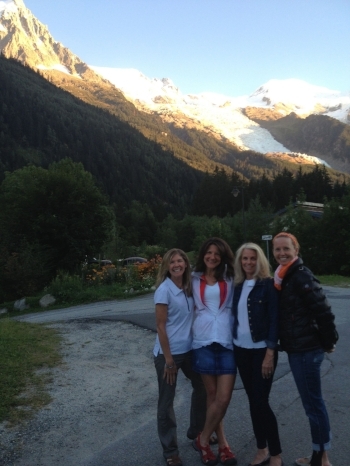 Okay, I was extra delighted because I would be joining these ladies in Chamonix, France. Oh la la! Linda had informed me there would be some “race details” we would need to sort out for crewing her and Pam for their races. 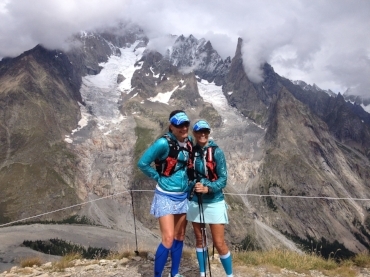 Linda had raced UTMB the previous year and Pam had been crew for her, but they were both racing this year, which was wonderful to feel their excitement and energy. I was happy to hear that I would be joined by another gal who was familiar with both race courses as she had been there previously to support her brother. It turns out this gal pal would be Sarah Gaylord Williams (ahem...brother of Topher Gaylord, a seasoned ultra runner whom I admit did not know about until I met Sarah). And Sarah, well, she became an incredible buddy in such a short period of time. Luckily we arrived into Chamonix several days in advance of the races so we could familiarize ourselves with the area and do some race planning. The landscape around Chamonix was spectacular. Sarah, with her experience here before, turned out to be very well-informed of many race logistics that I would’ve had a hard time learning on my own. I quickly adopted her as my UTMB-CCC crew mentor because she had great insight as to important details I would need to be aware of, where I would need to go, and when I would need to be at certain spots along with ensuring I had the proper “toolkit” with runner supplies such as first aid. Through group discussions, it was decided that Sarah would be support for Linda and her UTMB race (168km distance) while I would support Pam and her CCC (100km) race. Both of these races go through Italy, Switzerland, and France (ending in Chamonix) and both races are extremely challenging. Before race day, we did some reconnaissance by foot on the Italy side of the course for UTMB. Once back in Chamonix, we had a few days to plan more for the races and enjoy the town. Sarah and I explored the surrounding trails together. I quickly felt that I did not have my trail running legs on me from the Ironman training I had done this year. Sarah was quite an inspiration for me though and I did my best to keep up with her as she would appear to float effortlessly on these trails. Aside from loving the trail running opportunities around Chamonix, we got in a few swims at the outdoor pool, which had stunning surrounding scenery. What's better than outdoor 50m pool surrounded by mountain beauty! The race planning was a bit tricky given that we had two races at two different start times AND start locations with only one car AND no one in our group who could speak fluent French! We devised a plan, a backup plan, and yet another backup plan for our support crew logistics. Again, I realized now that I was on the “other side” of the race, not being the athlete but being support for the athletes, which brought on a newfound appreciation for those who have supported me in my previous races. The support crew has quite a job, especially for ultra endurance events. 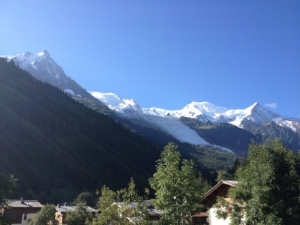 Race day was on Friday, an early morning start for Pam (from Courmayeur, Italy) and a later afternoon start for Linda from Chamonix. Sarah and I drove to meet Pam near the start area (Pam wanted to take the bus to the start to be with the other athletes) for her CCC race. The energy in the town was hard to dismiss and the race start was unlike anything I had experienced before from a spectator perspective. Pam was off on her race. After a 'delicioso' espresso shot, Sarah and I took off by car and then by foot to try to meet Pam along the race to cheer her on. Happily, we met a gentleman who was going out for a trail run at the same time to check out the race. After an exchange in bits of Italian, English, and some mock sign language, we joined him for a steady uphill run. Sarah and I were impressed with this guy because he moved so gracefully for an “older” gentleman... and then we learned he was over 70 years old. Dazzling. Sarah and I enjoyed the scenery while watching the front of the pack leaders of the CCC race. Unfortunately, we didn’t get to see Pam before we had to leave to return to Chamonix and meet Linda for the start of her UTMB race. We did snap a few more photos before running down the mountain. This was one of those times where Sarah got me out of my comfort zone, a ‘pose’ I would never consider on my own but she captured my joy at being in this spectacular place brilliantly. And then I got a great shot of Sarah! Man, those mountains are crazy beautiful. We buzzed back to Chamonix and time seemed to pass quickly. The next thing we knew, it was time for Linda to get going. I thought the energy in Courmayeur was blazing, but the start of the Chamonix race was even more crazy fun as the whole town seemed to come out to cheer on these hundreds of runners as they begin their 160km race through 3 countries and incredibly challenging terrain. After the UTMB race started, Sarah and Randy (Linda’s husband) left town to meet up and cheer on Linda later on in the race while I got ready to hop on a bus for Switzerland where I planned to meet Pam at Champex-Lac. This is about 56 kilometers into the race and the first point where racers can receive assistance from their crew. It was a long time to go without seeing Pam and I was feeling nervous. I was following her checkpoints online and could see she was still out there going strong, but I also knew she had been suffering with an Achilles injury for quite a few months prior. She had told me she hadn’t done more than a 12-mile run recently, so I was worried for her...like a mom (which I’m not, but I felt like one in my heart), or a caring friend and a fellow runner. The bus ride to Switzerland was crazy. One of those situations you hear about where you’re on a huge touring bus on tiny, narrow European roads... on the edge of a cliff. Deep breathing and going to my “mental happy place” was mandatory on this couple hour bus ride. Regrettably, I did not get any good photos of Pam coming into Champex-Lac. It was dark and when she arrived, there wasn’t much time to spare to get her in and out of there so that she would make the subsequent time cut-offs. I can tell you that I was absolutely thrilled to see her and if you know Pam, or have seen any photos of her, you know that her smile is beyond lovely. I was shocked at how good she looked, how strong she seemed, and her attitude of perseverance and gratitude was holding steady. Though she didn’t know it, she was teaching me lessons, not only about ultra running, but about life. One of her well-known mantras is “I don’t have to do XYZ, but I GET to do XYZ.” (replace XYZ with any task, challenge, duty, etc.) Anyway, as her primary crew support, I did a systems check with her to see if she needed any bandages, blister care, heat/ice, massage, etc. She didn’t need much at all. I assessed her nutrition and hydration status and she was doing very well as her level of metabolic efficiency training was serving her beautifully. She ate a few pieces of cheese, drank a few sips of Coke, and nibbled on a few bites of fruit. Her GenUCAN had been working as planned. She had no GI distress and no energy lulls. After a big hug and my version of a pep talk (although she didn’t really need my pep! ), she was outta there and ready to fight for the next 45km of the race. Aid station at Champex-Lac. Craziness in that tent! Meanwhile, it was a bit hectic to figure out how to get a bus ride to the town of Trient, the next stop where I could catch Pam (another 16km for her). 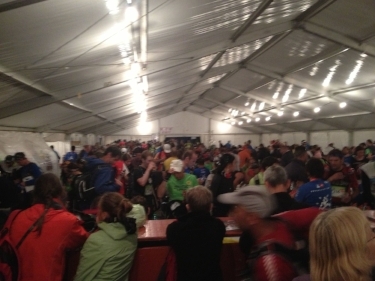 It was midnight and many runners had dropped out at Champex-Lac, so the crowds waiting for transportation were outrageous. There was no order whatsoever and there were only a couple of buses working that late. Having patience serves you well in times like these. Somewhere in here I received a text message from Randy notifying me that Linda had to drop from the race due to back/hip pain she was having. This was a result from her Badwater 135 race just 6 weeks prior, so it was obvious she did not have ample time for recovery. I was so sad for her, but at the same time, I was relieved she was smart enough to drop without injuring herself further. She was listening to her body and she knew the right thing to do. Around 1:30 to 2am, I met up with Sarah, Linda, and Randy in the town of Trient. Linda was in fairly good spirits, which was good to see, and she was also extremely excited for Pam’s race. All of us hung out together anxiously awaiting Pam’s arrival into Trient. I don’t recall a whole lot from this encounter other than one of the first things Pam wanted to know was how Linda felt and whether she was okay. We did another round of “nutrition, hydration, body” systems check and still, all was going fairly well. What a kick for the wee hours of the morning. There was one last stop in Vallorcine, where we could catch Pam before heading to Chamonix to wait for her finish. I have to admit that I got teary here seeing her come down this hill with a bit of a hobble in her step, but with an attitude that said “I’m still giving it my all”. I believe there was a time limit of 26 hours for the CCC race. Back in Chamonix, we were biting nails and getting antsy as the clock had reach 25.5 hours. What do you do? Wait, hope, pray, bite nails, wait. Repeat. The glimpse of Pam coming into town is still to this day one of my favorite memories. As she rolled into the finish, she looked like sunshine on a new day. Okay, maybe that sounds corny, but seriously... she had fire in the belly to get to that finish line before the cut off, which she made with 9 minutes to spare. We were all so excited for her. A bonus for us is that we also got to see our friend, Sandy Suckling, finish the UTMB race a few hours later. I had met Sandy in Death Valley, where we crewed together for Linda at the Badwater 135 race. She is another amazing woman and ultra runner. Sandy (in the blue cap) headed for the UTMB finish. That's her husband, Colin (in the red shirt), chasing after her with the camera. Sandy in her UTMB finisher's jacket looking good! This trip was incredible in so many ways. I will cherish these memories for many years to come. Above all, I felt honored to be connected with these women and learned that as an athlete, it is a good thing to be on the “other side” to gain new perspectives and to see that we all have different places to go mentally and physically. Me, Pam, Linda, and Sarah. Love these gals.